The folks in Orchard, Massachusetts aren't hard to impress regarding social media. Ruth Clagan--she's the owner of the Cog & Sprocket--is only a few years older than I am, but she's hopeless on social media. Correct that--she's hopeless doing it. As a subject, she's a natural. She has such passion for her clocks it is infectious. Her years of working with students makes her a natural at explaining what she is doing so that anyone can understand it. To top it all off, she looks good on camera. It took a while to convince her to let me follow her around with a camera, but it's paid off. The countdown to the new clock tower being wound and working is on, and folks are excited! She's got a following. Not to pat myself on the back too much, but it doesn't help that I've been up nights editing footage. I may even use some of it for a class documentary next semester. You know, when I first came to Orchard, it was because I was taking classes at Harris University, and I needed a job. I was purposely unengaged with my life, and determined not to care too much. This gig was just a job to help make ends meet. But then the Cog and Sprocket got under my skin, and I couldn't resist. I started to care. To care about the Reeds, to care about Ruth, to care whether she and Ben make a go of their relationship, to care about Jack Clark and his parents. Bezel and I bonded, and it was all over. I love my adopted town, and don't mind using my mad social media skills to let the world know. 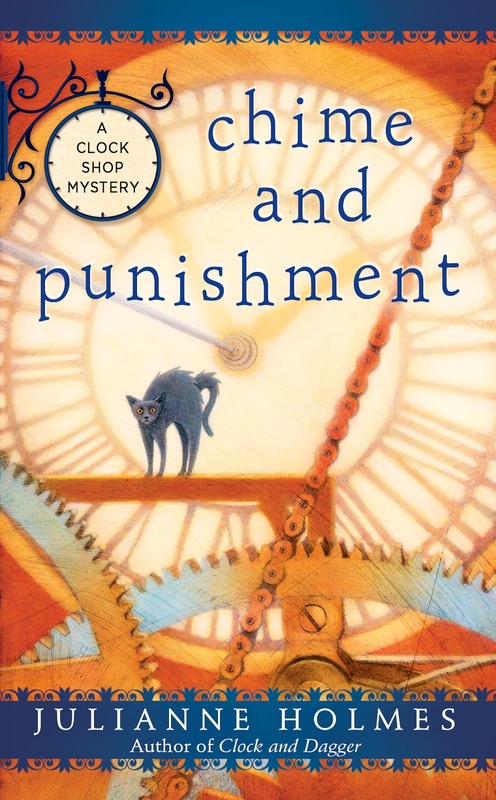 Friends, Ruth Clagan is a clockmaker, and the Clock Shop Mystery series is about timepieces. Do you have a clock in your life that means something? Let me know in the comments. 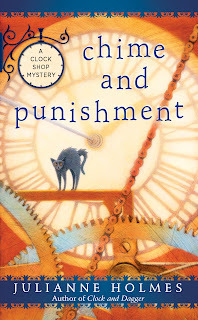 On Tuesday, August 22 I will pick a name from the comments, and send them a copy of Chime and Punishment! I love cuckoo clocks. My sister got me one and then when she died I got hers and now I have my mother's. They are all unique and different. My father's clock he received when he retired means a great deal to me. The clock I remember from my childhood was my great grandparent's but I don't know where it ended up. I remember really liking the sounds it made. My favorite clock is an Atmos that runs on barometric pressure! It was my grandfather's, my father's, mine, and now belongs to my son. When we lived in Europe 30+ years ago (US Air Force), one of the 'ideas' was, one would return to the States with either a new baby, a shrunk, or a grandfather clock. We didn't come home with any of that, but with an original oil painting. I really would have liked the clock also. As it is, our cell phones have become our clocks. I have a wrist watch my husband bought me. It is beautiful. Unfortunately, I have gained weight and it no longer fits. I have the wall clock that chimes and has a key to wind it that my parents had in the house I grew up in. I remember my Dad winding the clock on Sunday mornings after breakfast. That clock really reminds me of my parents. I have a Royal Albert Old Country Rose China plate clock on my fireplace mantle. My grandfather loved trains. My grandparents used to have a clock with trains on it that whistled on the hour. I used to love seeing that clock on their kitchen wall every time we came for a visit. It still hung there even after it stopped working. It's not a clock; it's a watch belonging to my great, great grandmother. She wore it on her sweater. When I was very young, she let me wear it around the house. I thought it was funny that it was upside down to others. What an exciting theme for a cozy! I'm very intrigued! I used to have a grandfather clock that was given to my ex-husband. I loved that clock but wen we had our house fire it went up in flames. It never got replaced. So now my go to timepiece is my watch from my husband the band is made of hearts. Thank you for the chance. My mother has the loveliest wall clock. When I visit it does take some getting used to. It dongs very loudly each half hour and on the hour- ALL NIGHT too. My grandmother had a neat clock with a windmill that spun around That I always loved. My aunt got it after Grandma passed away and now her daughter, my cousin, has it. I've never seen another one like it and am jealous I don't own t!